Marine craft tend to be highly polluting in both the use of fuel and the consequent emissions compared to other forms of transport where fuel efficiency has seen many advances - the efficiency of the drivetrain of water born vessels remains at a level which has seen few step-changes. One particular innovation was in the field of Contra-rotating propulsion. Duodrivetrain™ is a unique end-to-end performance engineering product destined for conventional shaft-driven boats <28m in length. Without special hull design, this class of vessel has not previously been able to access the energy saving properties of Contra-rotation propulsion. A new configuration makes the installation in a new vessel possible without any major redesign or even change of layout so keeping the desired shaft-driven configuration. The product can even be retrofitted taking over the zone of the existing shaft drive propulsion and in most cases will result in space improvements on the vessel in question. 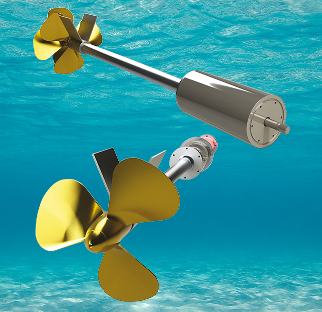 minimising bow lift, reducing vibration, providing the lowest draft with propeller configuration whilst achieving much lower fuel consumption at all speeds. Monodrivetrain™ is a sister product to the disruptive technology contra-rotating design which also allows the use of the innovative ‘Cassette Shoe’ ™ and which can be part of a managed pathway to a full Duodrivetrain™ installation. Duodrive have completed design of the 250HP model which will be part of the prototype based on a 10m Lochin 33 Sports Twin and have engineering designs for the 450HP unit with larger scaled sizes.